To tell the truth, I didn't notice the electric blue spots until I looked at the pictures. By eye, I thought the critters were just black and yellow with red heads. Old eyes, I guess. These things were really working over what seemed to be some large Forget-Me-Not plants (Hackelia sp?) that were just starting to bloom. There'd be lots of plants with no caterpillars, and then one with a dozen, in probably three different instars (molts). Here's one that I counted around 20 on the real plant, though it was kind of hard to keep track of what I had counted and what I hadn't. I think of it as my "Where's Waldo?" picture. I have no idea what species these caterpillars are. Perhaps some of my Lep Soc friends will tell me. Location: Washington State, Goat Rocks Wilderness, South Fork Tieton drainage, south-facing slope at altitude 5250 ft, UTM T 625828 5149342 (NAD27 CONUS). June 30, 2006. Snowline on this date about 5500-5700 ft.
Canon 300D, Sigma 18-125mm. Single caterpillar is about 1-1/4" in length, the largest I saw. Great capture Rik. Looks like something no animal would want to eat with all those nasty looking hairs. Looks like something no animal would want to eat with all those nasty looking hairs. I would venture to speculate that those hairs may just contain a venom of some sort. However I am not positive. I give caterpillars like this a wide berth, recalling my childhood encounters with "Packsaddles!" Great shots Rik. It is amazing what the lens picks out for us, that our own eyes so often over look. You could say that the camera sees better with one eye than we do with two. Anyway if it were not for the possiblity of being subjected to painful irritation by those hairs, you could get a bucket full of them and go "bluegill" fish'n. I did take the risk of "petting" a couple of these caterpillars just to see if they would sting. Nothing -- apparently my hide's too tough. Actually I've only encountered one small group of stinging caterpillars out here in the Pacific Northwest. Those are the Hemileuca sheep moths that I posted about some time back. They're annoying, but I understand your packsaddles are a lot worse! 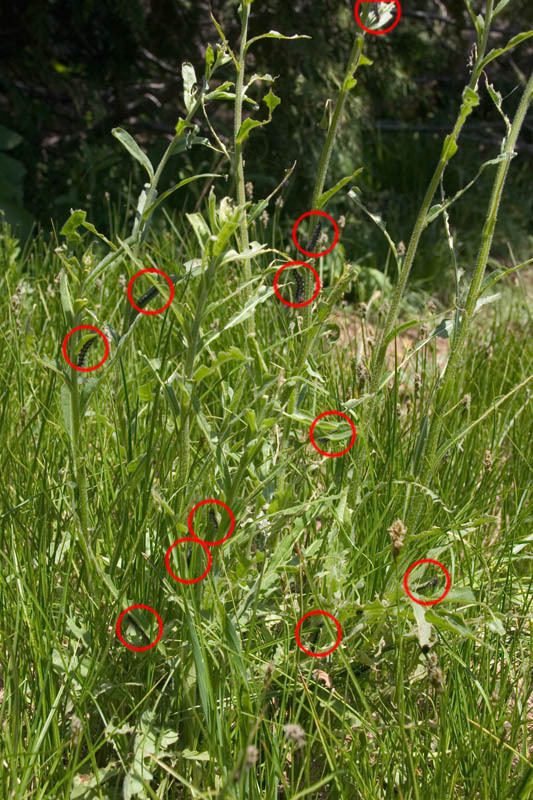 By the way, I got an ID on the caterpillars shown above. Apparently they're Gnophaela vermiculata (Bluebell moth). That's a spectacular day-flying tiger moth, see http://bugguide.net/node/view/8447. Thanks to Bill Yake of the Northwest Leps group for the rapid ID. I don't know of any catepillars that sting. Most of those "spines" are for looks to would be predators. Nice pic too. I really like the blue on your subject. Most of those "spines" are for looks to would be predators. True enough -- that's what makes the exceptions so interesting and memorable! I grew up about 6 miles south of British Columbia, on the east side of the Cascades. In that area, the only stinging caterpillars were Hemileuca, and they were so rare that I only ever saw one bunch of them and didn't know what they were. My mom was always nervous of my habit of petting all the caterpillars, but as far as I know that all traced back to only one incident of seeing a large caterpillar that was almost certainly Hemileuca hera get dropped/rubbed onto one of her schoolgirl friends. The kid reacted pretty intensely; I gather the experience made quite an impression on everybody around. In your area around Victoria, BC, I can't think of any caterpillars that would sting, either. The puss caterpillar...is densely clothed with long, fine, tan or grayish to brown hairs, and appears docile and harmless. However, concealed within its furry coat are venomous setae which, on contact with skin, produce severe reactions: intense burning or nettling; inflammation and development of pustules and lesions; numbness and swelling; intense pain; and nausea. Victims of puss caterpillar stings sometimes require medical attention. 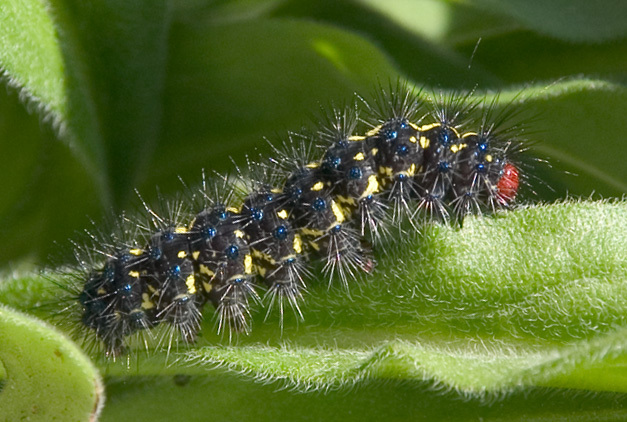 The same article discusses numerous other stinging caterpillars, including the Buck moth (another Hemileuca) and the Saddleback (packsaddle), which it rates about equal to each other and much less severe than the Puss Caterpillar. It's probably worth mentioning that to dismiss spines as being "for looks" may miss a lot of the story. By far the most dangerous enemies for most caterpillars are other insects -- both straightforward predators and the parasitoids like Tachinid flies and Ichneumon wasps. I've watched spiny caterpillars twitch around when being probed, and my impression was that the flailing array of spines made a pretty effective barrier, far from just a matter of looks. And the next predators up are birds. I haven't spent a lot of time researching this, but offhand I'd guess that the mouth of a typical bird is a lot more easily stung than the skin on my hands. We should probably see how the usual targets react, before writing off a defense as being for show. In any case, all this talk of spines begs a question. How come some caterpillars have spines, some have dense hairs, and some are completely smooth and naked? To which I can only say, "Some questions too hard -- I don't have a clue!"